After almost a whole day of travelling, we were tired when we arrived at Langkawi – “our” idyllic island. We seated ourselves in the hotel restaurant overviewing the sea and were thinking of having an early alfresco dinner. The sun was setting and the view was so beautiful; we decided we would go for a walk by the sea instead, chasing the sun as it went down. When we reached this board walk, the street lamp was already lit and the view from the board walk was unbelievably enchanting. The last rays of sun light reflected from the teak wood walkway. We strolled in the direction of the sun, without knowing where the board walk was leading to. We finally reached the very end of the board walk where the shore turned into a rocky beach. We climbed up and down the rocks, having fun. . . . . . and followed the sun . . . . . . . . . . . .
Lovely photo and a great story. I wish I was walking there right now! Oh my! What a beautiful photo! That looks like a wonderful place to relax, and let the worries of the world fall behind. Enchanting is the perfect word for it! Rest and enjoy! Excellent composition and I like the warm orange and cool blue together. So serene. that is just gorgeous. and so relaxing to read! Beautiful photo – those colors – and that blue up in the corner just sings! That is so romantic, what a wonderful way to spend an evening. Excellent color and composition, Michael. Looks like fun and a gorgeous place to be. 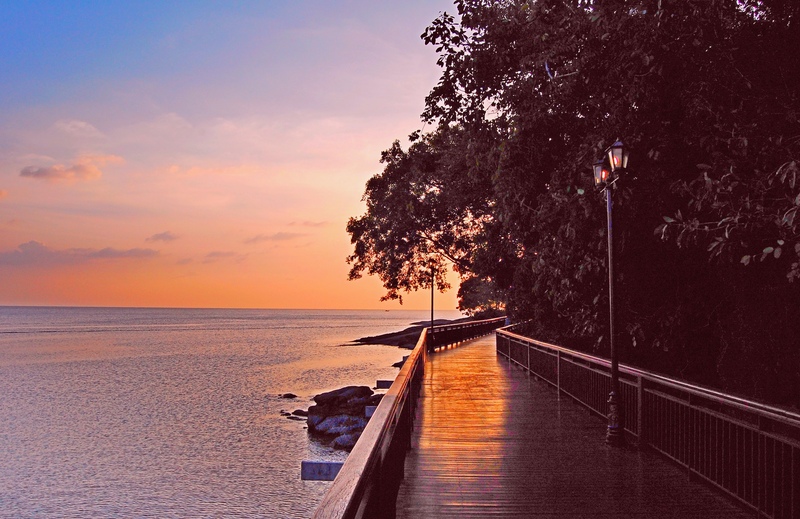 What a beautiful shot; I love the sun’s reflection on the teak boardwalk! What a scenic retreat! Have learned something, an Alfresco dinner … I did not know what that is. But I’ve googled and it turns out to be eating outside. Beautiful picture! Just look at the horizon reflected on the boardwalk! The sky and water beneath make great combination for coloured images. welcome. Very beautiful sunset. Thanks for sharing. Beautiful shot Michael, a moment to remember in a nice place!! Beautiful photo, Michael. Blessings, dear friend. Magical … Michael. I wouldn’t mind walking there into the sunset. Magnificent, Michael. As though another world beckons you around the bend. serenely beautiful, Michael! with a touch of romance, too. great shot as always! I love the way that the sun reflects on the boardwalk too. Nice photo…. Hello Michael, I tried to read all the replies and I hope no one ask this question before : does it’s an HDR pictures ? Have a great day, Vincent. Hi Vincent, this is not an HDR photo; I am not yet into HRD yet. Sometimes, I find that the HDR picture is not a real representation of the visual reality. Have a great weekend! A magnificent photo! An excellent accompanying text. I enjoyed reading it. Follow the sun always! Many thanks for the like on both the image and the text. Have a great weekend! Wonderful shot and great color! You shot this hand-held? What was the ISO? The result is just beautiful! A great eye for composition, Michael! This is a HDR? This still does not answer my question about ISO :). Yes, well, we don’t talk that much at all, do we? Take care, Michael. 🙂 Thank you for replying, Michael. Ah, what simple pleasures that bring the most joy! As always, it is the simple impromptu pleasure that brings the most joy. have a lovely weekend! Wonderful words and an even more extra ordinary photograph!! I was captivated by the boardwalk, actually. Where in Langkawi is this? Thanks. Absolutely gorgeous! Who wouldn’t want to take that walk?! My definition for spiritual formation is a quote that Eugene Peterson, author of The Message (a version of the Bible) took from Friedrich Nietzsche: “a long journey in the same direction.” Your photo of the beautifully-lit walkway disappearing into the horizon is my new favorite to illustrate that concept. Just wanted to add, so calming. Stunning photo – bravo for walking towards an “unknown” destination! Very beautiful photos Michael. I’m glad you stopped by my blog and liked some of my pictures too. Wonderful capture–brilliant and radiant wave of nature. Lovely! I especially enjoyed the balance between the sheen on the water and the sun’s light on the walkway. Very balanced and tranquil. Beautiful sunset!!! I remember fondly as a little girl, my Mom would call everyone to the living room window to see the sunset. Since then I have chased many and always have been grateful for Mom helping me appreciate their beauty. Glad that you have gone back to one of my older posts. Thanks very much for the perusal! You are welcome! I’m sure you will like Langkawi! Just blissful! Postcard perfect, my friend. Yes, post card quality – I have picked this from several pictures of similar exposure / setting! I’m traveling to Langkawi next week! This gorgeous shot just made me so excited. You will enjoy it. Safe travels! Nice Shot! Langkawi is indeed a magical place! The only place I have ever seen water glitter at night! thank you for liking my post! Exquisite. So glad I found your blog today. A lucky find for Chinese New Year!! Great to hear from you and best of luck and health in the coming year! It was such a beautiful walk into the sun! You are quite right, there are so many idyllic beaches in Langakwi to fell in love with. Many thanks for the following!